I've turned 60 and have certainly noticed changes which I don't like but can't seem to change. I really dislike the M&M dress you showed, though your version is much improved on the pattern envelope. I find that fitted clothes are more flattering but any clothes that actually fit well will be more flattering than those that don't. I totally agree with Anne's comments re fit - it is the key! This was made evident to me when designing custom bridal - it is amazing how the right fit and proportions can make any figure look stunning! I am not as slender now and I prefer shift dresses and avoid anything with a fitted waist. Making a more relaxed fit i.e. modern Japanese clothes help too. I am loving Marilla's Roberts collection pattern at the moment - its very forgiving on the body! I honestly am shocked at hearing that you are 47. I thought you were probably in your 30s. Maybe its just because I am 67 that other people look so young to me. Yes, that body shape sure does change. I went from hour glass to fire plug over the years. I like skirts and pants with a contour band that sits just below the waist. To add to it, I just make several cuts from the top of the band to the seam line. Spread, creating little triangles. My favorite skirt pattern is Style Arc Sally Jean skirt; I've made several -- some slight A-line like the pattern, some pencil with back vent. I am 54 years old and have recently gained 20 kgs. due to medication which I must stay on for life. Luckily I was very underweight to begin with but I have changed from an hourglass shape to more of a barrel shape. I now have to rethink all my dressing rules. I am relearning how to sew in order to get a good fit in my new wardrobe. Any help would be appreciated. My recently discovered "sew-lution" to the need for a bit of waist ease is the blouson. I hate tucking things into my skirt or pants waistband and that "too tight" feeling that develops my the day's end. In any straight hem blouse I insert a small casing and narrow elastic. I can then raise the top's hem to the most flattering level and this indeed looks less casual that having the hem left un-tucked. I have been complimented on this style too! Thanks for raising this topic. This post just made me feel like one of a very accepting group. I gained 15 pounds about 5 years ago and have had not been able to get rid of them. I am now 50 and while I get periods, it's intermittent, so I'm fairly sure this is age related. Self acceptance is important, but I'm still mad at the change... but not self loathing. Thank you for your open post and self acceptance, because you look lovely. Jane - I just want to tell you how your first para affected me because it is authentically "body-positive" (Lord I hate that term). I'm almost 46 and I've been writing about this phenomenon for the past 3 years. Though I posses the same sewing knowledge (and a somewhat expanded waistline), I'm so traumatized by the new status quo and, frankly, I'm grieving my former shape. Yeah, first world problem, I know. Mind you, I'm a stylish woman, dammit, so I have found ways to sew (if infrequently lately) and purchase body-skim things that keep me looking chic. You're a lesson to us all! "Barrel-shaped" Yes! That captures my shape much better than "apple," although I admit it makes me think of my grandFather and the Monopoly man. Here's my beef: Patterns seem to be designed from a single perspective, and I'm not talking young-thin. No, they all consider how the dress/shirt/pants look from the front. In this shape group, a side view is all important. I still have an illusory shape when you're facing me, but catch me sideways, and I'm a barrel or fireplug. You can add the sideview pattern perspective to your extensive list of things to write about - I for one would love suggestions. Now, isn't sewing wonderful that it allows us to discuss this issues rather than wondering if we're alone? At 46, I definitely hear you on the changing body shape. All we need now is some frank and open discussion of the menopause (staggered at how little I know and how little information is available) and women will have officially taken over the Internet! I, too, would have put you in your mid-thirties, so keep doing whatever you're doing, it suits you! Already into my 50's and on the other side of menopause (Ugh, early) I have spread that is very stubborn. So I have been working around it for years now. There are moments when I get VERY frustrated trying to look stylish and current, but not trendy. Find that if i stick with some basic silhouettes I'm safe (straight or A-line skirts, button down tops, cardigans). But that can get a hair boring. I am on the hunt for a classic yet modern shirtdress pattern. It's always a fine line between cool and frumpy, at least for me. I would be very interested to see a list of others suggestions of transitional patterns! I just turned 51 and really, I'd be a shocking liar to blame any of my size on my age. Except the amount of time I've had in life to eat pies! But here's a couple of tips: symptoms of menopause are like symptoms of other things. Hot flushes are a give away but others include dizziness bending over, insomnia, feeling really grumpy, strung out, tired. Frazzled is a good way of summing it up. I kid you not, from 48 I went to 2 GPs and a gyno and none of them pinged I was menopausal. Now I am finally on hormones and feel less like a homicidal kettle. But my hair is falling out. Ho hum. So don't put up with any stupid medical advice. As for styles and sewing - if you intend to keep and wear clothes longer than a year, I advise no polyester, acrylic or nylon. Or even blends. These fibres feel like plastic wrap to me now, like I can't breathe. Rayons, cottons, silks and wools are all fine. Style wise I have ideas. I wear the same two styles of dress all summer and am moving towards the same two styles of dress all winter. I love dresses so much, because I only have to make one decision about what to wear in the morning! Hi! I'm in the same boat. I've just spent the weekend sewing as nothing fits. In the past year My 40 something tummy has gone crazy, Partly due to meds and partly due to "laydee" problems. So (sorry to over share but I think a lot of girlies don't like to talk about it) due to a massive fibroid that makes me look pregnant I've had to rethink my wardrobe (hysterectomy here I come). You're right fitted and skimming seems to work for me. Fitted pencil skirts and trousers in stretch fabrics on the bottom and jackets, princess seams and cool neck lines on the top. I've just made How to do Fashion No 7 vanlose top and a fitted simple sew pencil skirt which do the job but please do some more posts on this as I think there are a lot of us out there need help. Thank you. I agree with your suggestion of stretchy fabrics for skirts and pants, love ponte knit for those. I have the same issue as you (large fibroids). Please do some research before agreeing to a hysterectomy. I did, and was shocked by what I read. The fibroids will go away on their own when your hormones decrease at menopause. Great topic! There's a lot of us feeling the same way. I would love to see you do a post full of suggestions on what to make and wear in our middle years. I'm in my mid-50's and want to look stylish, not like the 20-something's and not like a granny. The thicker waist is the big challenge for all of us. One of the reasons that our bodies thicken through the middle is that our spines compress a bit with age -- which means there is less room for our organs inside our rib cages. This spinal shift, along with long years of slumping posture, may make one have a forward-thrusting head. That means we need to add length to the back of bodices, and take away length from the front, to accommodate our necks and avoid a choking sensation as our blouses/dresses ride up at the front. Shoulder seams may need to be rotated forward. As bellies bulge, bums may disappear -- so that crotch curve you worked on so many hours to fit your full buttocks will now need to be reworked into an "L" shape to take away the extra fabric that pools around the tops of your thighs. Also, you might have to decrease your waistline from side to side in the back while simultaneously increasing your waistline from side to side in the front. I'm definitely interested in hearing ideas for sewing patterns that work well with a larger waist. I've noticed that some Indie patterns have more realistic waist sizes and I appreciate that. I don't want to fiddle with a lot of adjustments to patterns so I tend to pick looser fitting styles. Wow girls what can I say? I've read all your comments with interest & thought to myself " oh my life it's not just me then!". I'm going to be 48 next month ( can't believe it as I'm still 25 in my head). 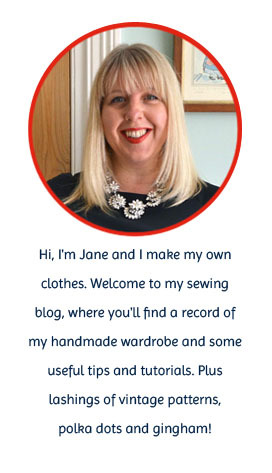 I'm a brand new dressmaker because I got fed up with clothes not fitting & looking rubbish. I mean why pay £55 for a badly fitted skirt when you can make one much nicer for less than £20. The thick waist is a problem. Please help Jane. I look at patterns & decide I'm a size 16 or 14 but my waist is 2 or 3 sizes bigger. I'm becoming obsessed with fit & could do with a bit of guidance. I remember the days when I had a 26" waist but that was BC (before children). Thanks for your blog I'm getting some great tips. Oh, Tracy, I can identify with your issues! At 43, I had a little girl - and my waist never recovered! I'm now 48, and like you, probably a size 14, but my waist is a whopping 39"! So, I have to make my own clothes as it's impossible to find anything which fits. Thanks so much for your inspiration, Jane - and I'd have put you a good ten years younger than you are! What a great post, so interesting and obviously something which affects everyone (even us middle aged men!) As a specialist supplier of knit fabrics (www.girlcharlee.co.uk) I may be biased but like you say, our fabrics are comfortable, offer a good fit and that bit of stretch when needed. I know that the Cashmerette range is excellent "Modern patterns designed for curves, in sizes 12-28, and cup sizes C-H"
Even, when you feel hungry at odd time, drink water to satisfy your hunger instead of eating any other thing.